THE QUALITY OF CUT IS JUST THE BEGINNING. Mow with precision. Negotiate an incline. Till a garden. And mulch your lawn. 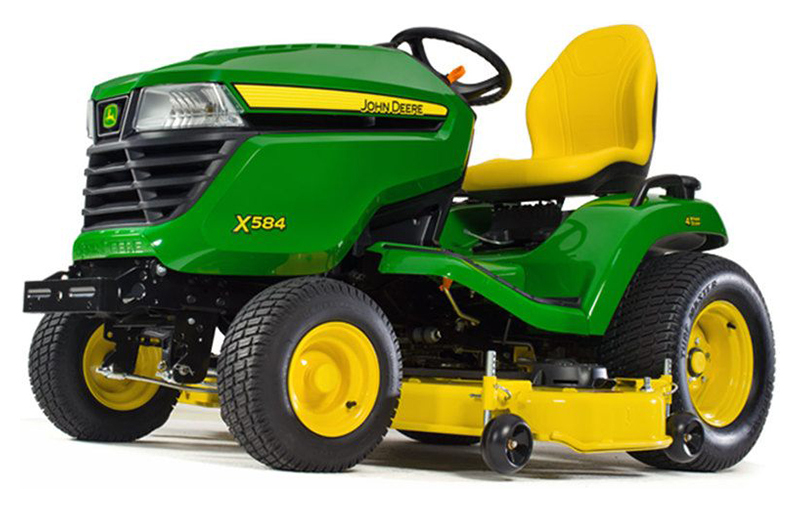 X500s mow where you need to go, and do heavy-duty work, too. Their wide stance enhances stability on hillsides. Traction can be increased simply by pressing the foot-operated traction control. Heavy-duty frames work with ground-engaging equipment like tillers and blades. And features like the on-board deck-leveling gauge assure a quality cut every time. And the optional MulchControl™ Kit makes feeding your lawn easy. Engine is smooth running and reliable V-twin air-cooled design. Frame is formed from thick steel and welded for reliability. The 48-in. (122-cm) Accel Deep™ (48A) Mower Deck cuts clean and is versatile. Lever-action or electric one-touch MulchControl™ options are available for extra mowing convenience. Operator station is comfortable and convenient. Control and display functions are easy to identify and convenient to use. Four-wheel steer gives superior maneuverability and trimming ability. Serviceability is convenient with easy-open hood. The MowerPlus™ app helps maintain the tractor and lawn. Snow removal and yard care is a strength of lawn tractors. Hydrostatic transaxle has traction assist. Modern styling is eye appealing and functional.